In the past two years, I have received several reports of fields suffering yield loses due to stem rot. Last year I saw several affected fields. This year, I am starting to get reports of fields being affected. I visited one such field last week. After the water was drained, plants in the affected area seemed to burn down and dry much quicker than the rest of the field. Much of the rice was down. 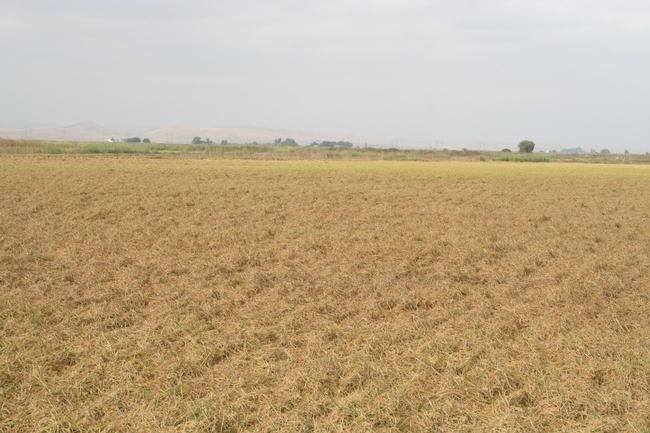 Inspection of the tillers showed outer lesions that were already dry. However, when cutting open the tillers, the inner sheaths and main culms were rotted. In some cases, mycelium and sclerotia, the resting state of the fungus, could be seen growing inside of the culm. Most panicles were partially filled. This field most likely will suffer a yield loss. 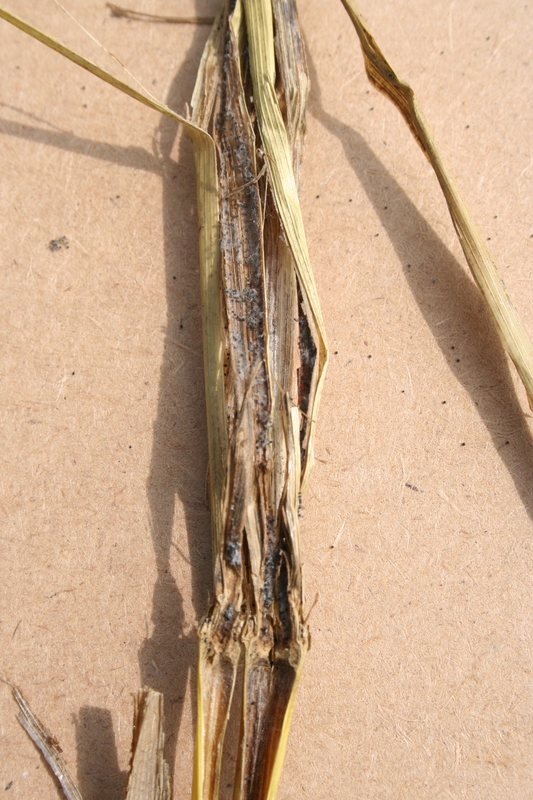 Stem rot infections start at the water line. 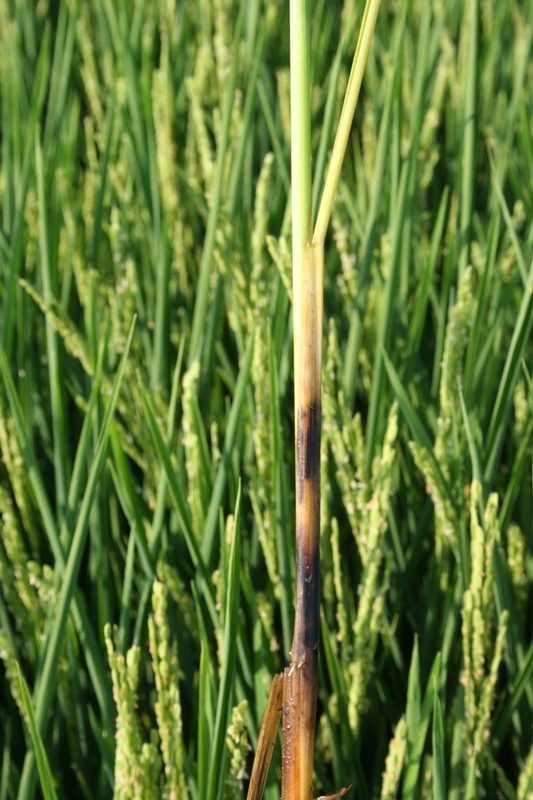 Surviving sclerotia from previous seasons float to the surface of the water and infect plants during tillering when conditions are favorable. Infected young tillers may die; later infections on older tillers can reduce panicle size and grain quality, and increase lodging. Management of this disease should incorporate several tactics, probably the most important is residue management. The severity of this disease has been shown to be related to the amount of inoculum present in the field. As the number of viable sclerotia in the seedbed at the beginning of the season increases, the severity of the disease late in the season increases. Straw burning is the most effective way to reduce the amount of inoculum in the field, but is not always feasible. 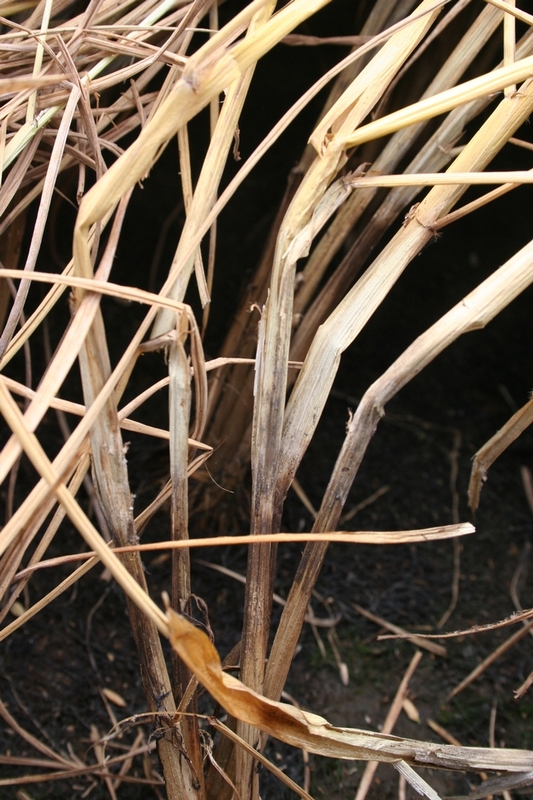 Experiments have shown that sclerotia survive better if they are inside plant tissue, therefore chopping and incorporating the residue to promote decomposition can help reduce the amount of inoculum. If baling, cutting the straw as close to the ground as possible will remove inoculum from the field. Nitrogen has been shown to affect stem rot. 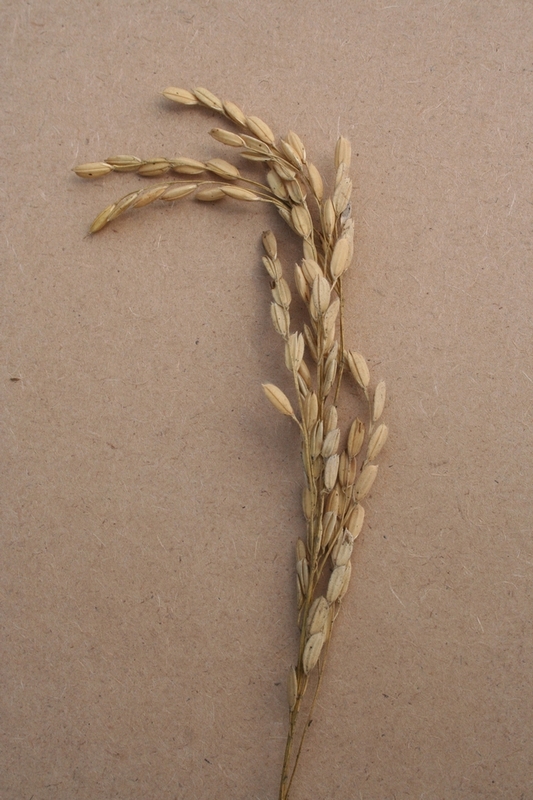 Excess levels of N can increase stem rot severity. In fields with stem rot problems, adjusting the N rate can help reduce the impact of the disease. Fungicide trials conducted in 2012 and 2013 seem to indicate that currently registered fungicides have an effect on stem rot incidence and severity. Further trials are being conducted this year to confirm those results.